On July 17, 2014, Malaysian Airlines Flight MH17 was shot down over Ukraine by a Russian-built SA-11 surface to air missile. The tragedy killed 298 people, the majority of whom were Dutch, as well as a handful of AIDS researchers. In the wake of this terribly unfortunate incident, many in the west are blaming Russia for having supplied the pro-Russian Ukrainian rebels with the sophisticated weaponry necessary to carry out the deed. In so doing, however, they are missing the forest for the trees, choosing the simple, cathartic narrative of Russian villainy over the reality. Whenever something like this happens, we want to know why. At this point we’ve determined that it was almost certainly pro-Russian Ukrainian rebels. US intelligence officials clear the Russian government of direct involvement. However, they claim that Russia “created the conditions” that led to the shooting. This is true in the very simple sense that yes, the missile that felled the plane was made in Russia and was put in the hands of the rebels by Russia, and we could just stop there and ask no further questions. The Small Why: Why did the Ukrainian rebels shoot down a peaceful passenger plane? The Big Why: Why do conditions exist in which there are Ukrainian rebels in the first place? Typically, when we’re trying to figure out why someone has done something, we start by asking what the expected benefit is. What did the rebels get out of shooting down the plane, or think they were going to get? The trouble here is that there are no satisfying replies to this question, no answers that make the deliberate targeting of a peaceful passenger plane make any sense. The consequences of such an action were plain and easy to see, even beforehand. It is clear to military groups that when they shoot down passenger airliners, they will kill people from a wide variety of countries, and that these countries will be embittered and aggrieved by those deaths. A full 17 countries account for the array of nationalities on board MH17. When you’re a rebel faction, you do not want to be the target of international hatred or resentment. You want foreign allies and you want states that could be your foe (like the United States) to decide to take no action against you. Shooting down passenger airliners is the quickest way to draw the attention of potential foes–it invites trouble. Rebel commanders gave the order to shoot down the plane while under the false impression that it was a military target. Rogue rebels targeted the plane without orders due to extreme anti-western sentiment brought on by the west’s support for the pro-EU government in Kiev. There’s an investigation pending, but in the meantime, Newsweek is claiming it has evidence for the former. Given that this was a mistake rather than a deliberate act, we should not expect other passenger planes to be in danger. The United States and Europe should consequently lift their bans on flying to Tel Aviv–just as the Ukrainian rebels are unlikely to deliberately target civilian planes, Hamas and other Palestinian groups surely recognize that attacking an international flight would be a public relations disaster for their cause. So we’ve resolved why the rebels shot the plane down, but why do conditions exist such that there are rebels in the first place? The proximate answer is that the Russians are arming the rebels–the rebels would not be able to stand up against the Ukrainian military without Russian support. But why are the Russians backing the rebels? The Russians see NATO’s Eastward expansion as indicative that the NATO member states are still seeking to isolate, contain, and weaken Russia. For decades, the Soviet Union maintained its security against the west through the Warsaw Pact, which kept many Eastern European states between West Germany and Moscow, providing the Soviets with a buffer zone against NATO. Now that these countries are not merely exiting Russia’s sphere of influence but entering NATO’s, Russia is both losing its buffer and conceding further ground to NATO. Relations were further worsened by Bush’s explicit claim in 2008 that he wanted to bring Ukraine and Georgia into NATO. The Russians acted swiftly to dispel this rhetoric, punishing Georgia for its NATO ambitions in the 2008 South Ossetia War. In international relations theory, this is called the “security dilemma”. States take actions to protect themselves and their allies that other states see as threatening. These latter states respond by taking steps to protect themselves and their allies, which the former states find threatening, and so on in a vicious circle. What each side does defensively is interpreted by the other as aggression. The Russians see EU and NATO expansion as aggressive behavior, and the west sees Russia’s interventions in Ukraine and Georgia as aggressive. Indeed, the Russians believe that the Euromaidan revolution in Ukraine earlier this year received western support and organization (this may well be true–American professor John Mearsheimer claimed as much in the New York Times, and it did not issue a retraction or correction). The plane was shot down because Ukrainian rebels made a mistake. The rebels were there and able to make the mistake because Russia has armed them. Russia has armed the rebels because it is afraid of a pro-western Ukrainian government. Russia is afraid of a pro-western Ukrainian government because such a government will likely join NATO. Russia fears NATO because it is a military alliance whose purpose Russia believes is to contain and weaken Russia. Russia believes this because NATO was founded for this purpose and has continually been expanded into territory that used to be part of Russia’s sphere of influence. Russia’s fears cannot be assuaged because no matter what western states claim, Russia cannot be certain about their future intentions. Russia cannot be certain about the west’s future intentions because there is no higher authority than states–if the west changes policy tomorrow, Russia has no external arbiter to which it can appeal (this we call “International Anarchy”). 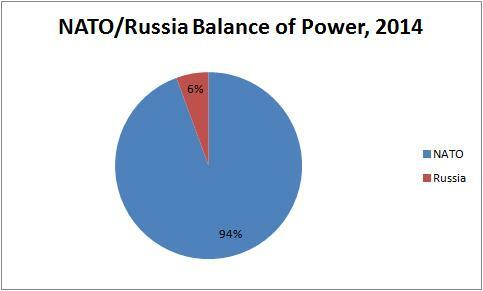 If Russia given an inch, it knows that NATO has the economic and military power to take a yard. Therefore if there is going to be a climb down to defuse the violence in Ukraine, it will have to come from NATO and the EU, both of which would need to acknowledge Russia’s security concerns and publicly promise never to admit Ukraine. They might even consider signing a treaty with Russia to that effect. But perhaps the west doesn’t want to defuse the violence in Ukraine at the cost of its EU and NATO ambitions. Perhaps it would rather endure Russian resistance to those moves. That’s a choice the west can make, but if it makes that choice, it need to recognize that the Russians will resist as much as they can for as long as they can and that this will get people killed. Nor is the west entitled to expect anything else, for it is every bit as much a party to the security competition in the region as Russia is. Ultimately, flight MH17 was shot out of the sky because NATO and Russia are really scared of each other. That’s not Putin’s fault or Obama’s fault or Merkel’s fault. It’s just the way the security dilemma plays out. If anyone is at fault, it’s the diplomats who decided during the 1990’s that NATO expansion was a good idea in the first place, and they could hardly have anticipated that their decision would get a few hundred people killed in 2014. But it did, and here we are. There seems to be a deeper philosophical issue here that needs to be resolved, which I can’t quite get my head round. Perhaps you can shed some light! If I read this correctly, you essentially argue that it is not Putin’s fault that MH17 was shot down, but rather it was the system that incentivised him to arm the rebels in the first place. To do this, you’ve tracked back through the origins of each level of possible ‘blame’ until you’ve reached something that’s plausibly fundamental. However, in principle you could keep tracking this back much further until the beginning of existence. 1. The soldier who fired the Buk SAM. 2. The commander in charge of the Buk SAM. 3. The leadership of the Russian-Ukrainian rebels. 4. The Russian FSB/Military who supplied the leadership with the Buk. 5. The Russian leadership who authorised the supply of the Buk (i.e. Putin). Now, here’s the philosophical issue: if most problems can be tracked back like this pretty much ad infinitum, how can we decide at which point to posit the blame? Why is the security dilemma any more responsible for the crisis than Putin for signing off the weapons sales? Surely there is not a single person we have to blame, but rather a series of actors who are responsible to different degrees. How we measure that responsibility, I’m not entirely sure. If we deny free will, we can argue that ultimately every action taken is ultimately caused by genetic and environmental factors that the individual decision-makers do not control. On that line of reasoning, no one person is the root cause of anything, because individuals do not choose who they are or how they think. In theory, this could leave Putin and those responsible for NATO expansion equally blameless in anything but the proximate sense. They just happened to be the people through which the genetic and environmental forces operate. That said, our arguments about what we should do contribute to the environment that influences the way we think and our ultimate decisions. So when we’re looking for the cause of this incident, what we’re really looking for is where the moral lesson is. What do we take from this to influence our thinking so that in future scenarios, we make better decisions? To answer that question, I think we need to know whether or not the actor in question had an alternative choice available that would have yielded a better outcome without imposing unreasonable demands on the actor. When we say the actor should have acted otherwise, we’re really saying that “in future, when we are in a similar situation to the actor, we should act otherwise”. 1. NATO is expanding, posing a perceived threat. 2. Ukraine is of high strategic value to Russia. 3. Putin is an autocrat who appeals to nationalism and has to look strong. Could we reasonably have expected Putin not to see NATO as a threat, or to have found some other way to attempt to maintain influence in Ukraine? I don’t think so. I would say that the decision to expand NATO was a mistake even given what we knew at the time in a way that Putin’s decision to arm the rebels is not, so it teaches us a lesson. That gives us a reason to point it out as an error. I enjoyed your article and one of the previous articles regarding the primary fault for the Ukraine situation lying with the US and NATO. A friend of mine who heads an internationally strategic studies institute very much agrees with you and vehemently (to the point of ridicule) disagreed with an article I wrote for the local paper taking the opposite position. My feelings on this are perhaps influenced by my former status as a ‘Cold Warrior’ but I feel that the current status Putin enjoys is fraught with risk. Regardless of the causes of the conflict of US culpability, he and his proxies need to be reigned in before the violence and conflict spread, which is a distinct possibility. I agree with your earlier premise that Putin and the Russian government were angered by the change of government in the Ukraine from a pro-Russian position to a pro-NATO stance and I understand this. We should not have gotten involved and the people in our government making these policies are amateurish. Still, the situation has changed and our policies must be based on the situation, whether it was the result of our doing or not. I’ve included the following piece for you to read along with Greg’s response and then my response to him. Let me know what you think of it all when you have time. Recent events in Ukraine which, without question, have their origin in President Vladimir Putin’s Russia, have caused shock and disbelief throughout the world. No apology or demonstration of remorse has been forthcoming from the dictatorial regime, and none can be expected. This is a leader who is in total control with no checks or balances on his power of any kind and who is becoming more and more lawless in his behavior. Several steps can be taken immediately to reduce the likelihood of another disaster of this sort occurring. Part of the reason that Russian leadership feels so emboldened to act in this manner is that they presume quite correctly that there will be no consequences to their actions and that they can act with impunity. President Putin continues to ride an unprecedented wave of popularity at home, due in part to the obsequious, fawning nature of the world community which has elevated him to a level of international prestige which is decidedly undeserved. Steps must be taken to reverse this trend, which would serve to rapidly erode his base of support at home and, hopefully, reign in his military adventurism. More aggressive economic sanctions—including freezing of assets and suspension of trade with Russia—would hit the Russian economy hard and serve to de-popularize the Russian president, making a change of leadership there at least a possibility in the future. Working with FIFA and the world community to revoke Russian hosting of the next World Cup and immediately confer this honor upon the runner-up would serve to de-legitimize the Russian President on the world stage and demonstrate his toxicity to the world. After recent events, he thoroughly deserves to be a pariah. 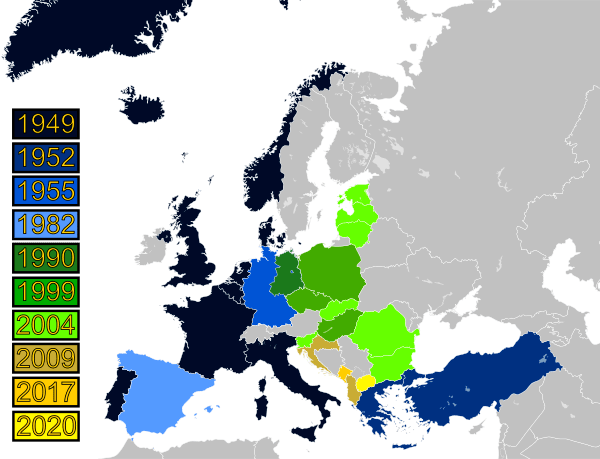 Establish a new ‘Warsaw Pact’ with a title such as ‘Organization for the Common Defense of Eastern Europe’ as a defensive, united military front including all of the former Soviet satellite nations and, obviously, excluding Russia. Joint, combined, defensive-in-nature military exercises and operations (which the US and NATO would support) could be held frequently. This would be designed to show President Putin that the cost of further military misadventures through the use of proxy forces anywhere in Eastern Europe would be unsustainable. Actively place the previously-abandoned missile defense shield throughout the member nations of the new defensive organization outlined above. This would be done over the petulant outcries of Russian leadership with a strong, unified military organization present to nullify any Russian threats of the use of force. In 1897, the great military grand strategist and advocate of seapower, Alfred Thayer Mahan, wrote the following. …the general temper of nations is more averse from war…we feel more dislike to the discomforts and sufferings attendant upon a breach of peace; but to retain that highly valued repose and the undisturbed enjoyment of the returns of commerce, it is necessary to argue upon somewhat equal terms of strength with an adversary. It is the preparedness of the enemy, not the acquiescence in the existing state of things, that now holds back the armies of Europe. On the other hand, neither the sanctions of international law nor the justice of a cause can be depended upon for a fair settlement of differences, when they come into conflict with a strong political necessity on the one side opposed to comparative weakness on the other. Why is Putin doing what he’s doing? Because he can. Well, sorry, have to disagree. The assessment of Putin and Russia, and, indeed, Ukraine, is so skewed by popular jingoism that it bears no relationship to reality. The gross violations in Ukraine have mainly occurred from the West, which triggered this entire and sorry episode. The pro-Russian forces in Eastern Ukraine took their leaf from the pro-Western forces in Western Ukraine, and these guys were paid by the West (and have a staggering history of anti-semitism). The reaction of the Orthodox communities in Eastern Ukraine was entirely predictable. They are certainly not under “total Russian control” and have caused more problems than solutions for Putin. Do not confuse the Crimea issue with Donetsk. Will send you our report from yesterday. Carrier battle groups and upgraded battlewagons are not only cost-ineffective; they do not frighten anyone any more. That is the real legacy of Iraq and Afghanistan. We can talk more in detail, but would not put great store in using antique weapons to fight tomorrow’s wars. I appreciate your response and understand your position. I wish I had access to the information you do, but, unfortunately, don’t. I just read your report which is, as always, interesting and informative. I understand and appreciate the possibility of a Ukrainian equivalent to the “Death to the Murderers of Herbert Anaya Sanabria” campaign which was a response by the FMLN to the deliberate murder of a UN human rights worker during the El Salvador war, allegedly by the government of El Salvador. In reality, it was the FMLN that killed Sanabria by way of doing what you point out as a possibility in your article, namely impugning the other side. Nevertheless, I feel strongly that, regardless of the origin of the situation in Ukraine, which you capably demonstrate began with U.S. and E.U. internecine meddling, civilians have been placed at extraordinary risk. This is, in my opinion, due in large measure to the inappropriate presence of Russian personnel, ostensibly pro-Russian rebels but probably with a large contingent of Russian military personnel either actively engaged in the fighting or at least advising the rebels. You would know much better than I do as I don’t have access to the kind of information that you have, but it is difficult to imagine that the Russian president and his government have no role in the violence taking place there or that such a role is justifiable, irrespective of Western or Ukraine government missteps or inappropriate actions. If the current state of affairs in Ukraine has caused more problems than solutions for Putin as you assert, why has he not publicly distanced himself from the situation or at least condemned the shooting down of a civilian airliner? His stance has, as usual, been defiant which makes your claim less credible and obviously makes President Putin a much less sympathetic character in this ongoing disaster. If what you say is true, a much more appropriate course of action on his part would have been to condemn the shootdown and use his influence (if possible) to insure that international investigators had immediate access to the site to determine what had actually occurred. Also, most of us, unfortunately, have not been informed of the sort of gross violations that you speak of and so my essay was based on the information that I have available to me. I was certainly not attempting to be jingoistic and am sorry that it came across that way, but I firmly believe, as is supported by the quote from Mahan, that strength is the backbone of diplomacy. I also believe that the US has abdicated any sort of position of strength and Putin is rapidly expanding his influence into the power vacuum. Believe me, I have no love or respect for Obama either, who I think is an out-of-date, out-of-touch meddler with no understanding of foreign policy or military affairs whatsoever. Kerry is equally incapable and an extremely poor choice for Secretary of State. I am certain, however, that without any sort of response of any kind to this situation, the instability and potential for larger-scale armed conflict in the region only grows. I believe that Putin is shrewd and understands well the Russian cultural respect for strength, which, in some measure supports and explains his actions and his popularity at home. I also believe that he understands history and his actions grow out of a true concern for Russian security, which he still genuinely believes is directly threatened by the West and NATO. If he was less aggressive, this threat would diminish. As has been said (forgive another jingoistic fallback) with regard to the Middle East, “If the Arabs laid down their arms, there would be no more war; if Israel laid down its arms, there would be no more Israel.” I believe that a similar reality is present in Eastern Europe—Putin has already taken aggressive military action in Georgia, Crimea, and now Ukraine. If this was not the case, the region would be vastly more stable. I absolutely agree with you, however, that the U.S. and the E.U. have no justification for meddling either, and that if we focused more on above-board diplomacy as opposed to secretive interference, things would not be where they are now. In terms of the seapower portion of my letter, I must strongly disagree that nobody finds a massive, seaborne military force intimidating or threatening at this point in time. If this is the case, why is China building a carrier fleet and expanding its conventional weapons systems arsenals? There are very few navies or even shore-to-ship missile systems that have the ultimate power to withstand this sort of blue water power projection, although they clearly do exist. Even if the naval assets I refer to are not as viable as they once were, they are still, in my opinion, extremely effective, if for no other reason than the massive firepower they can deploy from offshore and in naval surface warfare. While the possibility of large scale, conventional confrontations pitting top-gun fighter pilots and big-gun naval vessels against each other as in World War II is—I agree with you in this—extremely unlikely, having these systems as active and viable makes an unmistakable statement in terms of what we can bring to bear against a potential adversary if necessary. Perhaps in today’s world, this is no longer important and perhaps my views are outdated, but I still believe that a strong blue-water navy is invaluable, especially given our economic dependence on foreign goods and energy and the concomitant necessity of keeping sea lanes open (a whole other topic of concern). Our current state of affairs with regard to our military’s overall diminishing capability is fraught with danger from where I stand, but I’m sure you’re much better informed and knowledgeable about it than I am. Hi Charlie! This is an interesting exchange, and I thank you for sharing it. I think your disagreement with Greg comes down to your different views on just how powerful Russia is relative to NATO. On your view, the United States is projecting weakness and Russia is projecting strength. You say that Russia is “filling a vacuum” with an expansionist policy. This implies that Ukraine could be the first in a series of dominoes, that, if successful in Ukraine, Russia might proceed to intervene in other former Soviet states or even in former Soviet NATO members. Given that belief, it would follow that the United States would need to increase its presence in the region. I would say that we are already prevailing in Ukraine, that Putin has proven unwilling to risk the sanctions and military costs Russia would have to endure to pull off a full invasion of Ukraine, much less NATO territory. Once you buy that argument, the need for increased military spending in Eastern Europe, on additional naval forces or otherwise, disappears. Thanks for your quick and thoughtful response. I certainly hope that you’re right in this and other arguments you’ve made on your site. I read the articles you forwarded which were pertinent and strongly support your position. I still (perhaps stubbornly) feel that there is value in a collective security agreement in Eastern Europe that is external to NATO and, though I understand President Putin’s fundamental motivation, I still don’t trust him. At any rate, based on the articles you sent, it does look like things may resolve there soon which is, I think, in everyone’s best interest.